Discussion in 'Other Guitars' started by Paruwi, Jan 26, 2015. Fujigen Gakki Factory Tour!! | Drowning in Guitars! like Ibanez, Fender, Gretsch, Epiphone and others. Established in 1960, FGN has been manufacturing guitars and basses for many world famous labels for half a century – they're responsible for the high quality (and probably for the success) of many of the worlds most respected brands. Today, FGN is expanding into a global market with the aim to establish the name FGN as its original brand. Anybody owns one of this newer models from them ? like the 'Circle Fret System' - What do you think about it ? Although FGN cannot predict whether the Circle Fretting System will replace traditional fret placement, we've discovered through extensive testing C.F.S has a definite positive effect on the playability and tone of fretted instruments and this is an important consideration for the discriminating musician. While our work and research on this revolutionary concept continues, long-term testing conducted by respected professional guitarists in a variety of genres yielded invariably positive feedback. The most frequent comment was that the guitars sounded noticeably cleaner and note separation more distinct, contributing to a more balanced and full sound in both fretting solo leads as well as chorded rhythm passages. A further comment praised the fact this enhanced separation and clarity was noticeable even when the guitar was used in combination with various effect accessories such as overdrive, reverb or chorus sound effects. Some musicians noted their fretting hand tended to remain more relaxed since their fingers were not subconsciously searching to compensate distortions. What other New MiJ LP-type would be in this price and quality range ? kiko, Davis Sharp, BlackSG91 and 3 others like this. Very cool fret system. I've never seen that before. Barre chords must be a pain though. AJ6stringsting, Doug.Jarrold and El Cid like this. FGN/Fujigen new J-Standard models are coming out for overseas market very soon??? Looks like a P-rail ? Saw quite a lot of FGN guitars when I was in Japan last year. Very nice guitars. Which is the nicer one ? Doug.Jarrold, LucilleNoir, IGRocker and 1 other person like this. The Edwards division of ESP has some nice stuff. Ya some are new Pete.i bought the new old 2001 Korean made Epi Dot enstead.not that the guitars were bad just leary of forkin out 1100$ for somethin comming from china. 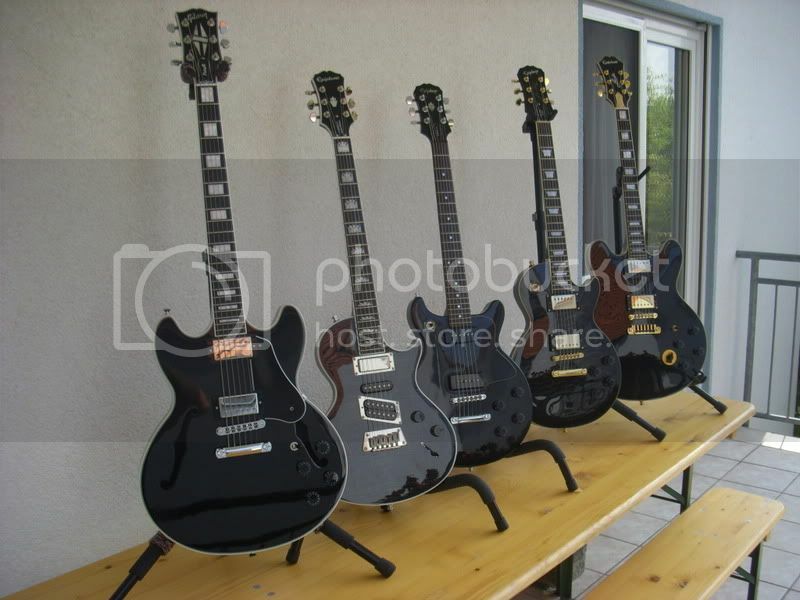 Check out the Edwards 335 Black ones.i was floored.outstanding lookin.im diggin those FGN guitars to.anymore i honestly think Epi,FGN,Edwards is building a better quality guitar than Gibby.dare i say that lol.my 1998 Epi dot is every bit as good as a Gibby.i love the thing.i mean sure Epis stock hardware and electrics are ok but hell how hard is that to change out.over all the fit and finish of these other guitars are much better in my opinion.that Epi Lester custom in my avitar i customized id put up against any Gibby.